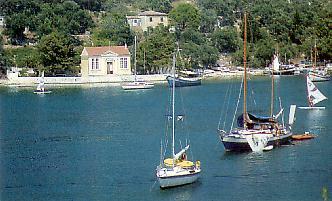 Paxi is the smallest of the six main Ionian islands. When you step ashore at Gaios, the island's little port, you'll find an exquisite miniature world just waiting to be discovered. One of the attractions of this island is its size. It is so tiny (10 km. long and 4 km. wide) that you can easily walk from one side to the other. At the same time, it is so thick with grapevines and olive trees that the whole place is like one big garden. Along its eastern coast, just a stones throw away, are the smaller islands of Panagia, Agios Nikolaos, Mongonissi and Kaltsonissi. During your stay on Paxi, you will find wonderful beaches and translucent waters, perfect for swimminig, snorkeling and fishing. Õïu should not miss taking a trip around the island in a motor launch, for a look at its spectacular white cliffs, punctuated by delightful coves and intriguing grottoes. Ïn the east side of the island sits Gaios, its capital and biggest village. Its charming l9th century houses, threaded by narrow lanes, lie at the end of a closed "fjord", surrounded by trees and shrubs. At the entrance to this picturesque harbour you can make out the islets of Panagia and Agios Nikolaos with its Venetian castle and windmill. 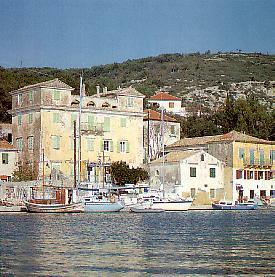 Laka is a little seaside settlement with a tiny harbour, built on a sheltered bay whose coasts are covered with olives and pines. Its low houses are particulary distinctive, painted in interesting shades of brown and indigo. The grotto of Õñañanti is only 2 nautical miles from Laka by motorboat. If you should happen to be in Paxi on the l5th of August, you'll want to follow the faithful who gather at the Monastery of Panagia (Moni Panagias), The festivities last all day and all night, winding up in Gaios with dancing in the main square. 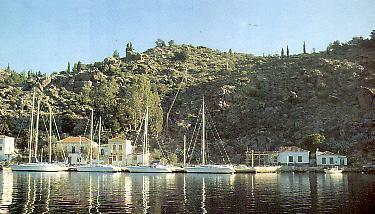 Pleasant excursions may be made to Panagia, Agios Nikolaos, Mongonissi and Kaltsionissi. From Paxi it is also possible to visit Parga on the mainland, a small town with a Venetian fortress and a wonderful beach, and Andipaxi, a tiny island 3 nautical miles (30 minutes away) from Gaios. About 120 people live on Andipaxi. Its slopes are practicaliy covered with grapevines and its beaches are superb. Totaliy unspoilt, quiet Andipaxi serves as a refuge for those seeking solitude, simplicity and serenity.